Holiday magic may seem like it’s just around the corner, but in Delaware It’s not too early to start celebrating the season. Beauty and excitement across the state are sure to bring friends and families closer together. From glittering lights and trees to ice skating and historical displays, there’s something for everyone to enjoy this holiday season. Times: 10 a.m. – 4:30 p.m. Step back in time at the Historic Odessa&apos;s annual holiday celebration - a seasonal tradition of interpreting scenes from classic literature, including the 175th anniversary of A Christmas Carol. Times: Gates open at 5:00 – 9 00 p.m.
Drive through a Cape Henlopen State Park filled with the bright, beautiful colors of the 1.5-mile “Light Spectacular” holiday light show, which includes more than 90 awe-inspiring displays. Enjoy the fun at the Cape May-Lewes Ferry Terminal, which will become the “Christmas Village.” The village will have an ice skating rink, live music, indoor holiday workshops, a strolling Santa and carnival rides, including a giant Ferris wheel. The Mansion will be decorated by some of the duPonts’ original decorations, including a German crèche, which dates from the late 19th century. The figures are soft ceramic, unglazed and hand-colored. In addition to their own ornaments, Nemours also proudly displays ornaments made by patients at Nemours Alfred I. duPont Hospital for Children. 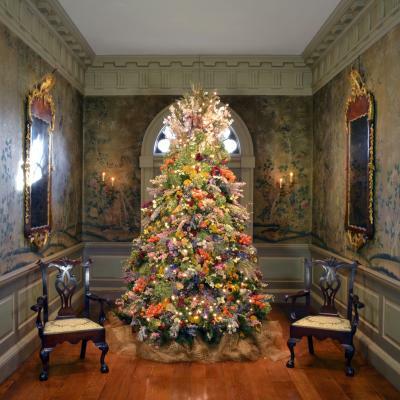 Yuletide at Winterthur showcases the warmth and festive spirit of the season with beautiful displays shown on a tour of Henry Francis du Pont’s mansion as well as lovely trees, exquisite room displays, and a magical dollhouse. Each room on this year’s Yuletide Tour tells a story reflecting the ways in which Americans have celebrated the winter holiday season from the 1800s to the present. Can’t miss displays include the family Christmas tree and the majestic dried-flower tree in the Conservatory which features some 60 varieties of flowers. Times: 6:30 - 7 p.m. Enjoy a refreshed version of the classic tale of a prosperous curmudgeon who believes that personal wealth is far more valuable than the happiness and comfort of others who is forced to face his selfish ways when three ghosts on Christmas Eve lead him through his Past, Present and Future. Times: 6 – 9 p.m.
Times: 10 a.m. – 4 p.m. The 1803 du Pont family ancestral home, Eleutherian Mills, will feature holiday decorations and interpretation on the French traditions of exchanging gifts on New Year’s Day and the celebration of Twelfth Night. Experience the du Pont ancestral home decorated for the holidays and "The Magic of Miniatures” exhibition, featuring a newly acquired dollhouse inhabited by miniature teddy bears. Times: Departs 12:30 and 2:30 p.m.
Why stand in line at the mall and wait to see Santa, when you can ride our train and have Santa come to you? The Jolly Old Elf himself rides the train and greets everyone on board, and gives all children a chocolate treat. Be sure to bring your camera and have Santa pose for pictures with your child during this 1½-hour round-trip to Ashland aboard the antique steam locomotive. Experience historic Lewes, Delaware as nine homeowners open their doors to the community during the Historical Society’s signature event, “A Christmas Tour of Lewes”. Historical Society properties are decorated for the season and a greens sale will be held at Freddie’s Barn. Many community organizations welcome visitors as the First Town in the First State readies itself for the holidays. Christmas in Odessa is a self-guided walking tour of private homes and public buildings, many dating from the 18th and 19th centuries, decorated for the holidays. The tour will take place on December 1, 2018 from 10 a.m. to 5 p.m. In addition to the house tour, we have many special events, which are included in the ticket price. Times: 5 – 9 p.m. Enjoy the night-time parade at 6:30 p.m. and other fun festivities happening downtown. Times: 1 – 6 p.m.
From 1-3 p.m., enjoy photos with Santa, face painting, and of course, cookies and hot cocoa. Horse-drawn wagon rides, beach tractor, and trolley rides through town will go until 4 p.m. At 5 p.m., gather at the bandstand plaza for the 4th annual lighting of the Holiday tree and caroling with The Remnants, the contemporary music group of Our Lady of Guadalupe. Times: Departs 5, 6, 7, 8 & 9 p.m. Enjoy a peaceful interlude at the end of the year with a 45-minute evening ride aboard heated 100-year-old coaches, each of which is covered with thousands of holiday lights. Many of our trackside neighbors decorate their homes and yards for our passengers to enjoy. The Stroll will include Strolling Holiday Carolers, Delmarva Miniature Horse Club, local entertainment and a visit with Santa Claus at the Santa House. We&apos;re excited to announce carriage rides are back this year! Refreshments and entertainment will be offered at most downtown businesses. This town-wide celebration, sponsored by the New Castle Presbyterian Church, presents private homes and churches decorated for the season, and musical events throughout the day. Rain or shine. Programs available at the NC Presbyterian Church, 25 E. 2nd Street. From 10am-4pm, admission will be free at the Amstel House (decorated for a traditional colonial holiday) and the Dutch House (featuring a celebration of St. Nicholas&apos; Eve). Times: 1 and 3 p.m.
Join us for a traditional celebration of the Feast Day of Sankta Lucia, a holiday that is still marked by light and music in Sweden today. The Delaware Swedish Colonial Society and Old Swedes Historic Site co-sponsor the annual December celebration of Sankta Lucia at Old Swedes Church. Enjoy a rare opportunity to see Eleutherian Mills, the first du Pont family home built in America, dressed for the holidays and illuminated with softly glowing lights. Lace, fresh greenery, poinsettias, and dried flower arrangements adorn holiday displays throughout the residence. Be sure to see new “The Magic of Miniature” exhibition. If you have time to spare, don’t forget that Delaware is the perfect place to finish up your holiday shopping. View top tax-free shopping locations here.